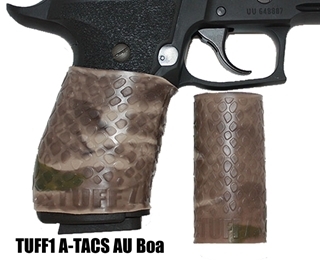 A-TACS, the “go-to” force protection and concealment systems is now paired with the functionality and durability of a TUFF1 Gun Grip Cover to produce the highest performing grip accessory available to recreational shooters, military and law-enforcement personnel. The TUFF1/ A-TACS AU utilizes a number shades of arid and urban elements combined with shades of earth and small amounts of green. Available in Boa Grip, Death Grip and Double Cross Grip textures. Standard USPS included in price.